#CANTHYDETHEFUTURE is an invitation to imagine our future with reproductive justice. There are no abortion restrictions. There is no abortion stigma. We can plan and construct our families without judgement or a prescribed notion of what family should look like. Our communities are thriving without the threat of oppression or violence. Queer and trans folks and women of color are centered. Sacred lands are preserved. We have justice. We are at peace. Curated by Megan Smith of the Repeal Hyde Art Project, this series focuses on the power of art as a tool for social transformation and imagination. Megan says: "As we reflect on the Hyde Amendment as reality for the past 40 years, it's also time to think about what a world looks like without it. 40 years is enough. Artists have the tremendous power to explore and envision the potential for new realities. Collectively, in this space, we are saying that our future is one without the threat and weight of oppression, violence, and colonialism. It is instead a place of of connectivity, wholeness, justice, openness, and love." Please consider purchasing a print of a work by clicking on the image below. All proceeds go directly to the artists. #CANTHYDETHEFUTURE is made possible by support from the Eastern Massachusetts Abortion Fund. JOIN US IN BOSTON ON OCTOBER 1 for an evening of art, food, poetry, and music to imagine a future with reproductive justice. Artist Monica Trinidad describes her work: "We have won the struggle for reproductive justice. Law enforcement and military-grade weapons no longer exist and Black mothers like Korryn Gaines are safe and thriving with their children. Indigenous people have total access to their land and water, with the ability to care for children with total sovereignty. Gender non-conforming and trans people are able to move freely and safely through the world, encouraging their children and their friends' children to reach for their ultimate dreams and desires. I utilized the words of Assata Shakur from her short poem "Love" because her words embody how possible this world is in the near future with joint struggle, love, and Black liberation." cause love is an acid that eats away bars. The hacksaw has two blades. The shotgun has two barrels. We are pregnant with freedom. Monica is a queer, latinx artist, activist and organizer born & raised on the southeast side of Chicago. She co-founded Brown and Proud Press in 2012, and For the People Artists Collective earlier this year. In 2014, Monica was one of eight young organizers & activists of color who traveled to Geneva, Switzerland to present a report on police violence in Chicago to the United Nations Committee Against Torture. As a delegation representing We Charge Genocide, a grassroots organization in Chicago, they staged a direct action inside the UN, calling attention to the murder of Dominique Franklin, a 23-year-old Black man tased to death by the Chicago Police Department. Artist Mac McCuster is a trans-artist based in Asheville, NC and completing a residency at Odyssey ClayWorks. They have an MFA in ceramics from Georgia State University and grew up in Savannah, GA.
Mac says about their work: "I made this piece to promote positive self body images and in response to body shaming that happens so often to trans people and women especially. It is also a reaction to the absurd bathroom bills that are sweeping the nation and denying safe spaces for trans people to use public restrooms. In the future it is my hope that we can all be equal and have access to the most basic human rights." See more of Mac's work here, and also check out Project Canary: "The extreme and misguided decisions politicians make have real life repercussions. As our leaders send legislation such as bathroom bills, twenty week abortion bans and more into action, people’s lives are impacted. They claim to be protecting people, but often the stories of those whose lives are negatively impacted by these policies don’t have the privilege of telling their story. Project Canary honors the experience above the rhetoric by connecting people to each other through their individual untold stories." Artist Leah Samuels says, "As a queer femme, I am an advocate for a world that thrives without the threat of oppression or violence. In the past, my personal art practice was focused on working through trauma. My current series is inspired by anatomy and the inner workings of the human body. It represents the conscious rebuilding of strength after the deterioration and fragility that trauma can produce within the body. The painting of flowers combined with anatomy plants the seeds of life, beauty, and growth within the deepest part of our physical bodies, the bones." Leah Samuels is an artist, astrologer, and educator. She has been teaching art and working with children for several years in a variety of settings, including the facilitation of groups and art activities for youth who are survivors of violence. Leah is drawn to the intersection between art & activism. She strives to present art making as a reflective tool to both understand and reimagine the world. Representation in media and the aesthetics of our world all communicate strong and subtle messages about who is included and what is deemed acceptable and appropriate. She is excited that social media has given a platform to marginalized voices who have otherwise been silenced around large issues that we collectively face today, including reproductive justice. Image Copyright Leah Samuels 2016. Artist Ella Mendoza says that this piece is about liberation. "When I migrated to this country, I was separated from my mother for most of my childhood. When I think about a future on which reproductive justice is a reality, I think of a world in which families can stay together, a world without borders, a world in which we are free. I believe in out future. I believe that we as artists are capable of sharing our vision with others, and when we dream of a future in which we are safe, we share that sense of safety. Art is such a powerful tool, and it can be used for so much, I believe that if we work together in our common vision, and our common goal, we come closer to a tomorrow in which all of our voices are heard and safe." Ella is an undocumented immigrant, and self declared illegal illustrator, born in the Quechua region of so-called-Peru and currently living in Salt Lake City, Utah. Her artwork and writing has been featured nationally in both academic and holistic settings, as a freelancer, as well as a representative of Familia: Trans Queer Liberation Movement, and Peaceful Uprising. Artist Kimberly R. Williams says, "When thinking about a post-oppressive society, I thought about why we choose to have children in the first place... America forces us to strive for the ideal 'nuclear' family which is a heterosexual couple, a couple of kids a dog and a white picket fence in the suburbs. This ideal leaves many people out. This ideal doesn't give many the right to simply live the way they want. That's how this graphic piece was born. People can have babies...or not. It's their right to simply choose their own kind of big (or little) happy family. Especially if that family is centered in love. - Queer Dream Team with Child"
Kimberly is a Pro-Afro Southern-Midwestern Graphic Artist that is willing to fight the good fight for social change. Her art focuses on helping to to liberate and educate others of macro-aggressions in our society. Check out her work including her #Irantwithmyart minimalist poster series inspired by current events, social justice issues and personal experiences here. Artist Meredith Stern writes: "When creating this, I thought about park benches as a public space for breastfeeding, relaxing, reading, thinking, drawing, talking, and doing all the activities that drive life. 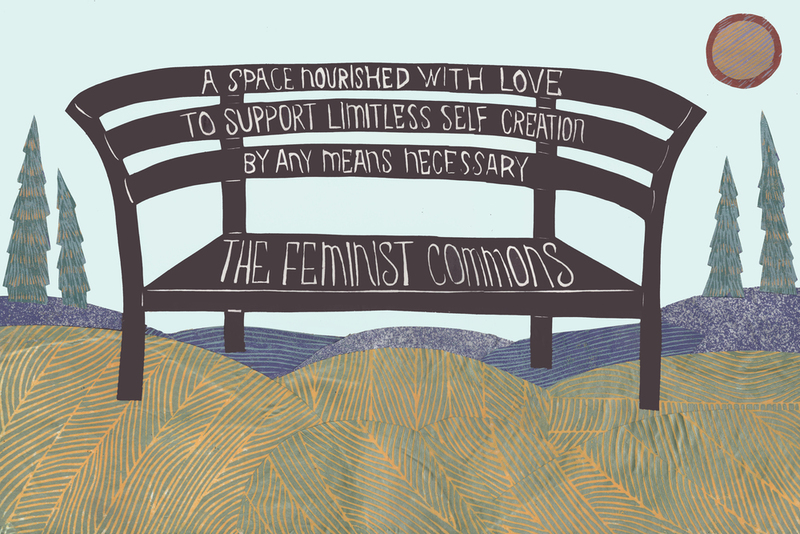 I think of them as a "free" public space (at least the ones that are shaped to allow folks to sleep on them) and therefore a good metaphor for public access for reproductive justice without boundaries." Meredith Stern grew up in rural town building tree forts with her brother and riding horses. She obtained a BFA in Ceramics at Tulane University in New Orleans. She is a member of the International printmaking group called The Justseeds Artists’ Cooperative. She has a multifaceted practice that includes printmaking, ‘zine publishing, gardening, and utilitarian ceramics. 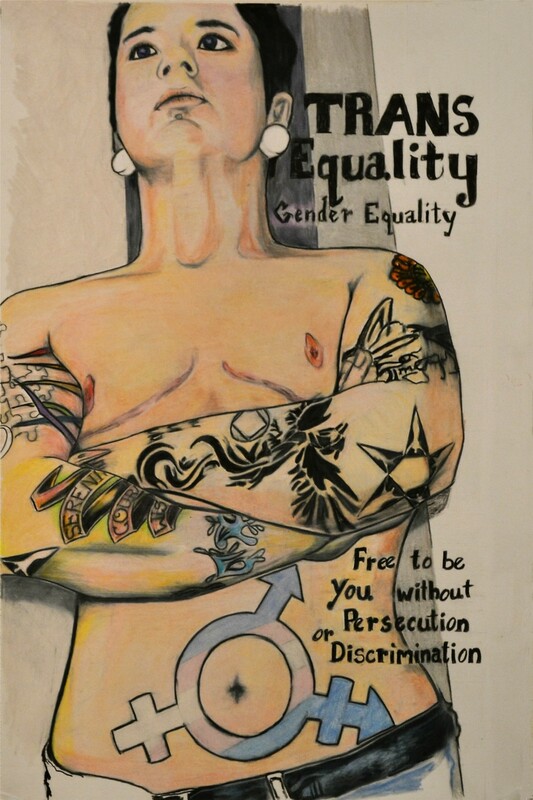 Her work focuses on gender liberation beyond binaries. Her work is in the permanent collections at the Library of Congress, Harvard University, the Book Arts Collection at the MOMA and in Museums and Universities around the country. In 2012 she curated a portfolio of writings and visual art on gender justice called “This is an Emergency!” In 2015 she created a series of 14 large scale 2’ x 3’ linoleum block portraits of creative people working in their studios titled “Craft in Time.” She lives in Providence, RI with her husband, three cats, and a toddler named Fox. Image Copyright Meredith Stern 2016. Megan J. Smith is an artist-activist and social worker who is passionate about using art to catalyze social change. In 2011 they founded the Repeal Hyde Art Project to create dialogue about abortion access and interconnected issues. Since then, they have created over 100 shareable graphics and facilitated 30 university-based Repeal Hyde Art Project installations. Megan has designed artwork and materials for organizations like Advocates for Youth, Backline, Ibis Reproductive Health, the National Network of Abortion Funds, National Advocates for Pregnant Women, and Provide. Megan is also the recipient of the 2015 Arts and Healing Network Award for Arts and Social Change. They currently reside in Boston with their partner and their 13 year-old cat, Boxer. 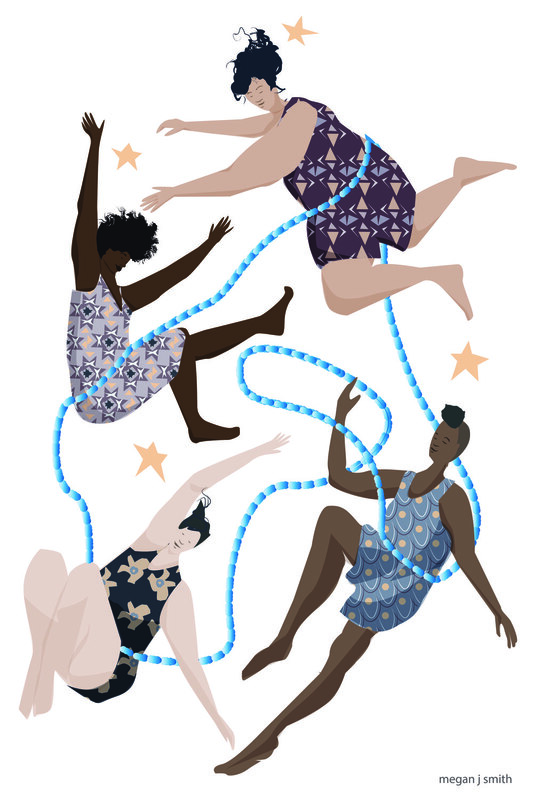 Megan says: "I created this work thinking about capturing the joy, wholeness, and connectivity that a future with justice will bring."